Plantain is ideal for fries and roasts because of its texture and it requires very little preparation work to make them delicious. This raw banana fry is easy to prepare and has bright bold flavours. 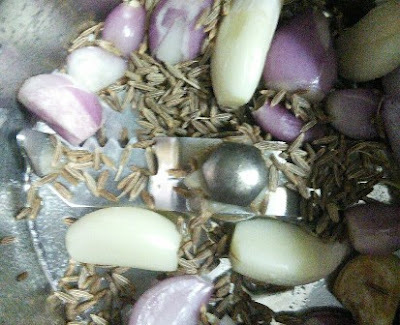 I have applied the same small onions, garlic and jeera paste to countless dishes and for plantain also its pairing was perfect. This plantain fry has so much flavour and taste, plus it's filled with fiber and anti-inflammatory ingredients. Just follow the instructions below and prepare this plantain fry for your kids then you can see a smile on their faces. You can also pack them for their lunch boxes for lemon rice, tamarind rice and curd rice. 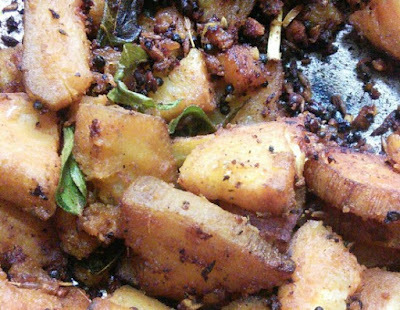 They won't say no for this plantain fry and of course it is healthy too. 1. 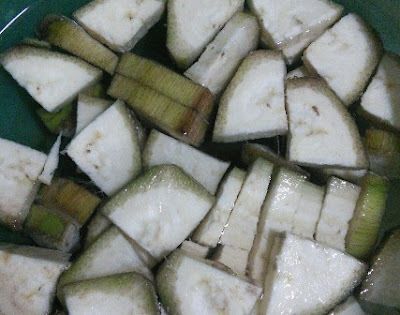 Wash the plantains and peel the skin. Cut them into small quarters with medium thickness. Put these pieces in a bowl full of water with little salt in it. This helps to prevent the discoloration. 2. In the meantime, grind the small onions, garlics and cumins coarsely. No need to add any water. 3. 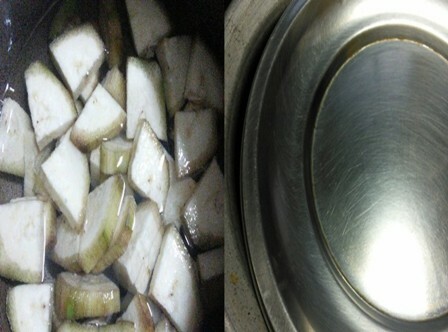 Take a deep vessel or pan and add 1 cup of water. Add the plantains to it. Keep on low flame covered with a lid and cook until medium soft. 4. When it is done, transfer it to the bowl. If there is any water drain the water completely. Allow them to cool. 5. Heat some oil in a pan and add mustard and urid dal. 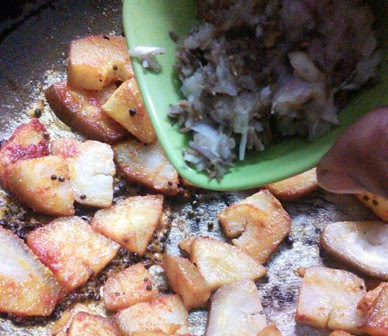 When it splutters, add the cooked plantains. 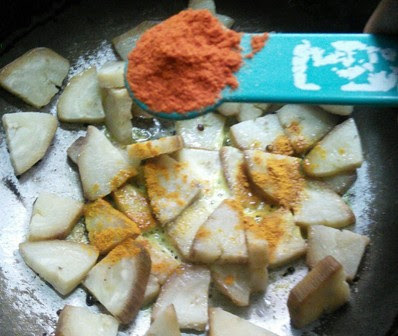 Add the turmeric powder and red chilly powder. Stir it and add the required salt. 7. When the powders are mixed well with the plantains add the paste. Mix them gently and keep on low flame. 8. 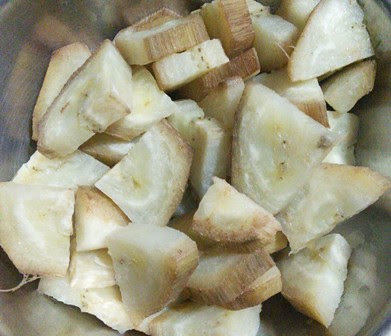 With regular intervals stir the plantains until it is roasted well. 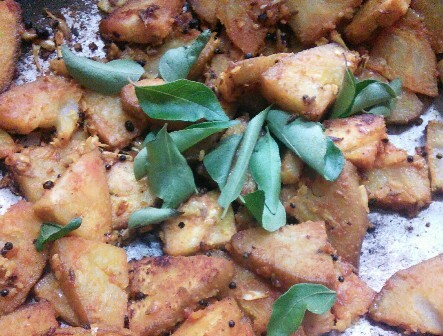 Swril a tbsp of oil while stirring occasionally and add some fresh curry leaves. 9. If they are done as shown in the picture below switch off the flame. 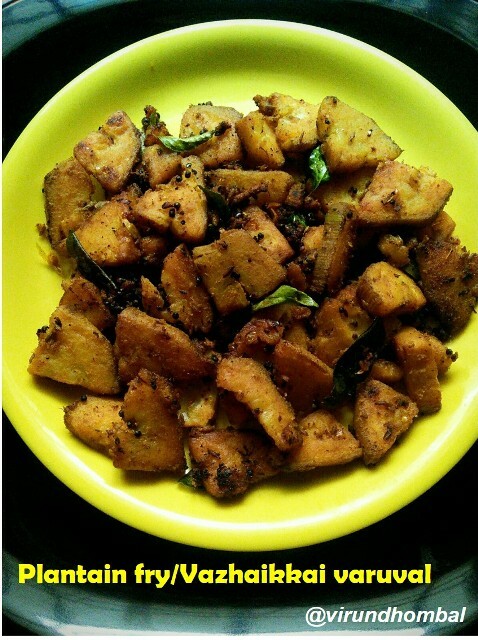 If you try this recipe for Plantain/Vazhaikkai varuval send us your comments below and share the recipe for your friends and family.